Corolla is more a place than a specific town or village. Corolla is actually the area from the Currituck County line at Duck to the end of the paved road. The 4WD section north of the end of paved section of NC12 is considered Carova. The Currituck Banks have always attracted seasonal visitors. For 100s of years, migratory waterfowl flocked to the Currituck Sound in the millions, and it was that abundance that created the 50 plus hunting clubs that once lined the banks of the Currituck Sound. The reminders of that time are everywhere, from the Whalehead Club in Corolla, to the subdivisions of the Currituck Club and the Pine Island, named after hunt clubs. When the Currituck Beach Lighthouse was completed in 1875, Corolla became the permanent base for the lighthouse staff and the adjacent Lifesaving Station. 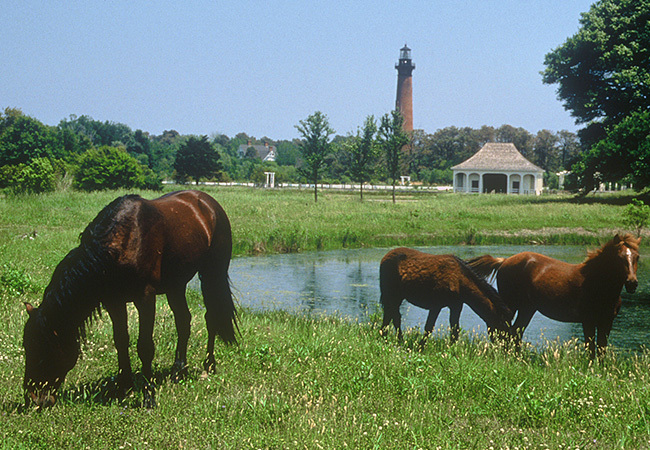 With it’s proximity to the lighthouse, the village of Corolla became the largest settlement on the Currituck Banks. Corolla remained an isolated village connected to the outside world by boat across the sound or a dirt road through Pine Island. In 1988, that changed. The state of North Carolina extended the paved section of NC12 to it’s current end at the 4WD terminus at Carova. There is one way in or out of Corolla – NC12 is a state maintained road that runs the entire length of the Outer Banks. Although the paved section of the highway ends about a mile and a half north of the Village of Corolla, the 4WD beach and roads in the Carova area are considered part of the highway system and traffic laws are enforced. The beach speed limit is 25 mph and drivers have received tickets for speeding or unsafe driving in the area. Corolla is actually divided into a number of subdivisions, so one of the best ways to get oriented is to know where the subdivisions are located. Has some of the larger, more luxurious homes on the Outer Banks. New construction has been especially strong for beachfront homes.The Autobahn Society’s Pine Island Reserve is located on the sound side. Located around a spectacular Rees Jones designed golf course, the Currituck Club offers year round amenities. One of the first Currituck subdivisions to be developed. Some new constructions still ongoing featuring five and six bedroom homes. A different look with a bridged entry and guarded entrance. Immediately adjacent to TimBuck II Shopping Plaza and the Monterrey Plaza where Food Lion is located. Located on the sound side. Beautiful homes. Includes a dock for access to Currituck Sound for residents and visitors. One of the largest communities within Corolla. Residential streets and easy beach access. Restored village featuring homes built between 1890 and 1920. An easy walk from Currituck Heritage Park, location of Whalehead Club and Currituck Beach Lighthouse. A unique shopping experience. An all inclusive resort with indoor gym facility, pools, tennis courts. Most homes are on the ocean side of NC12. Northern most subdivision in Corolla. A sound to sea development, much of the natural feel of the Outer Banks has been retained. A small fishing pond and hiking trail are part of the terrain. Wide, with soft sand, the Corolla beaches have consistently been mentioned as some of the best in the nation. There are a number of public beach access points in Corolla with the Currituck County Public Beach Access in southern Corolla a real standout. Restrooms, showers, a fair amount of parking and a wooden boardwalk leading to the beach. The only downside to the facility is the 200 yard walk to the beach from the parking lot. The county also maintains six other public beach access areas in Corolla: Corolla Village Road/Lighthouse Ramp, Albacore Street, Bonito Street, Herring Street, Shad Street and Sturgeon Street. All subdivisions have private access to the beach. Shallow and relatively protected from the wind, Currituck Sound is a freshwater to slightly brackish body of water. Easily explored by kayak or canoe, the northern section of the sound it dotted with islands teeming with wildlife. Spring, summer and early fall, osprey are often seen. Many waterfowl still end their winter migration in the sound during the fall. The Currituck Sound can also be explored on foot. There are a number of boardwalks and trails leading to the sound or paralleling it and they offer a wonderful glimpse into a remarkably diverse environment. A 39 acre park that contains the Whalehead Club, Currituck Beach Lighthouse and the Outer Banks Center for Wildlife Education. Currituck Beach Lighthouse was first illuminated in 1875 and it lit the last dark spot not on the Atlantic coastline. When automated systems were installed, the lighthouse keeper housing and grounds fell into disrepair. Now beautifully restored, the lighthouse can be climbed. It’s an incredible view from the top. There is a $7 fee for climbing. One of the most iconic symbol of the Outer Banks the Whalehead Club was built in 1922 by Edward Collings Knight, for his wife, Marie Lebel. Although it has never been proven, the story is told that he built the house after his wife was denied membership in a club because she was a woman. A huge building at 21,000 square feet, the Knights filled their new home with tiffany lamps, art decor furniture and a Steinway Grand piano. The building has been restored to its original glory and surprisingly many of the original pieces were located and returned. Also on the grounds is the Outer Banks Center for Wildlife Education, a wonderful little museum with a diorama of life on the Currituck Sound in the early 20th century. Included in the museum is an 8000 gallon aquarium stocked with fish native to the Currituck Sound and one of the largest decoy collections in the world. About a mile and a half north of the Village of Corolla the paved section of NC12 ends. The 11 miles to the Virginia state line is still accessible but only to 4WD vehicles. This is the area that the Corolla Wild Horses – the North Carolina state horse – roam. Genetically shown to be direct descendants of the Spanish mustangs of the Conquistadors, how they came ashore is unknown. The most likely scenario is they were survivors from a shipwreck in the 17th century. The best way to view the mustangs is to take a guided tour. It is illegal in Currituck County to intentionally come within 50 feet of the horses – and the law is enforced. Shopping in Corolla seems to have something for everyone with stores located in a number of plazas. The Harris Teeter Grocery store is immediately adjacent to the entrance to the Currituck Club. The shopping area includes a fudge shop, convenience store and restaurants. A little bit more than two miles up the road is TimBuck II, the largest shopping area in Corolla. Restaurants, handmade jewelry and art, a kite store and much more are a part of the experience. Across the road from Tim Buck II is Monterey Plaza which includes a Food Lion, the first supermarket in Corolla. Monterrey Plaza has a number of restaurants, and a deli. Just across from Currituck Heritage Park, the Corolla Light Shopping Plaza is a blend of stores and restaurants centered around wooden walkways. The Village of Corolla is a different shopping experience. With its restored homes now operating as stores, walking around the village is like a step back in time. There are no incorporated towns in Currituck County. There are satellite offices in Corolla available to conduct county business, but many local government functions are handled in the unincorporated town of Currituck on the mainland, where county offices are located. Concerns about a two hour bus ride for Corolla school children brought local parents together to create Waters Edge Village Charter School, a public, K-6, accredited charter school. The school is located in the Corolla schoolhouse that was built around the turn of the 20th century.